Last night Asa and I were lucky enough to attend a local fútbol game. Our friend Carlos won some tickets to the game and invited us along for the fun! Just a quick note about fútbol outside the United States and in Uruguay. 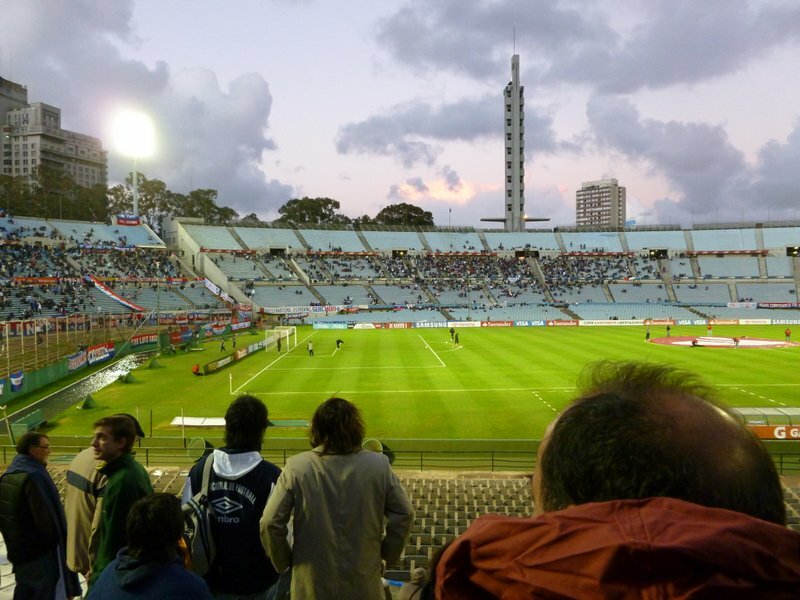 Fútbol is a “national pastime” in many countries and in Uruguay especially. The Uruguayan Futbol Association (the country’s governing body for the sport) was founded in 1900. The national team has won the World Cup twice; once in 1930 during the first World Cup Tournament (also held in Uruguay) and again in 1950. They came in 4th during the 2010 World Cup and have won the Copa América a record 15 times, including in 2011. The success of the Uruguayan national team has been cited as amazing by many in the press because of the country’s small size (about 3.5 million people). Check out the great info about the team on Wikipedia. In short: Fútbol is important here. Children start playing in local leagues when they are very young (i.e. when they can run and not fall over immediately) and they keep playing. 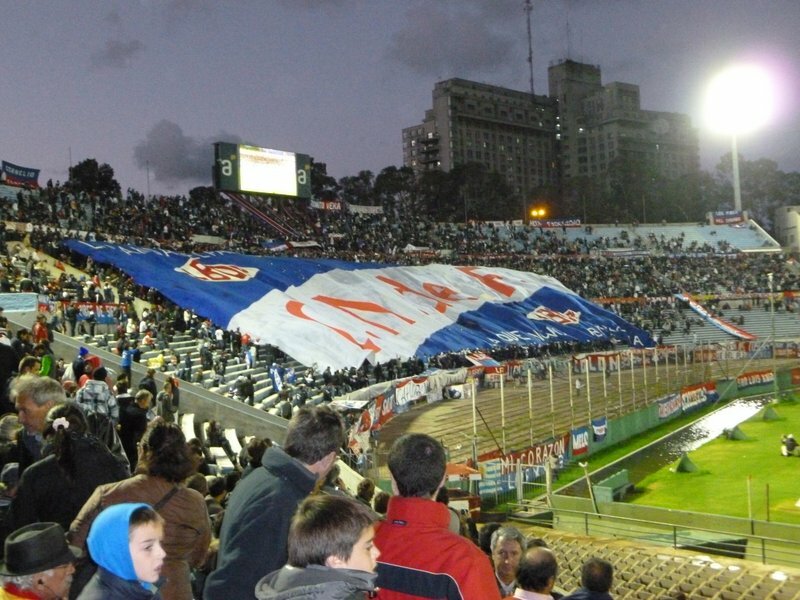 There are numerous teams in the country’s professional league, the two most popular being “Nacional” and “Peñarol”. When there are important games on television the city stops functioning (literally). Carlos told us that people will leave work early, stores will close, and people can only be found where they can see the game (i.e. at home or in bars). This type of interest/obsession with a sport can only be rivaled in the United States by the Super Bowl, which comes in at a very very distant second. 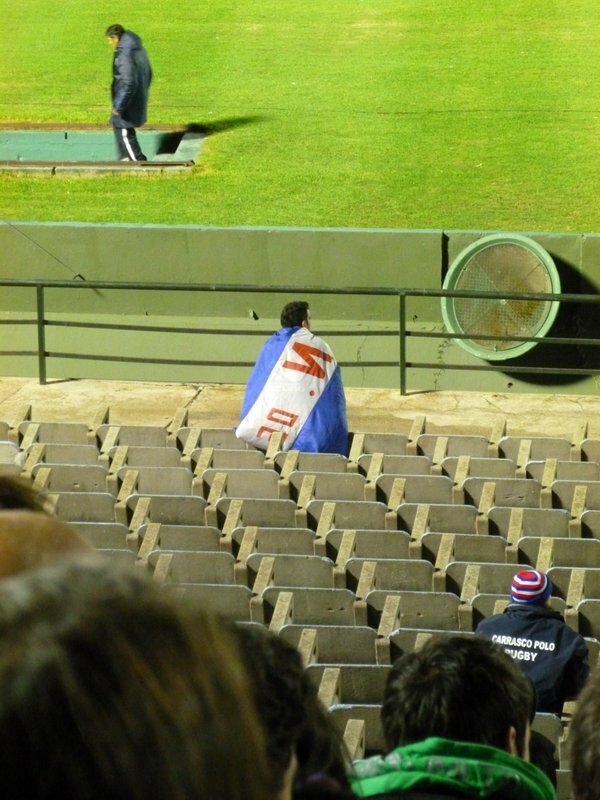 The game last night was Nacional vs. a team from Chile. It was one of several games in the Copa Santender Libertadores that occurs from January to July and involves teams from 11 South American countries. The game was at the open air Centenario Stadium. On our way to the stadium a crowd of fans from Chile were walking down the middle of the street yelling and carrying on, stopping traffic. Of course this was about 2 miles from the stadium. The turn-out for the game was pretty poor because of a cold rain forecast in the weather. We went prepared with raincoats, thick socks, and beanies. Despite the small crowd as a whole, the die-hard fans were there in throngs. Clubs in the city get together and get seats behind the home-side goal, where they spend the entire game singing, dancing, lighting flares and small fireworks, and in general being the “life of the party”. There was a huge fireworks display as the home team, Nacional, took the field. Carlos said that sometimes they fire off so many that they have to wait for the smoke to clear before they can start the game. Vendors walk around the stadium selling various things to eat including: potato chips, peanuts, coffee, tortas fritas (fried bread), and sodas. Just like anywhere else, prices were a bit more expensive than in the supermarket or local corner store. There were police patrolling everywhere, but weren’t checking bags or preventing people from bringing things into the stadium. We brought some sandwiches and cookies. The game itself was fairly frustrating. The home team, Nacional, had a ton of shots on goal and runs down the field, but for whatever reason couldn’t score. There were lots of yellow cards. A man sitting behind us even yelled “tarjeta (i.e. card)” every time a player hit the ground. I guess that’s part of the recent efforts to try and crack down on fouls in the game. 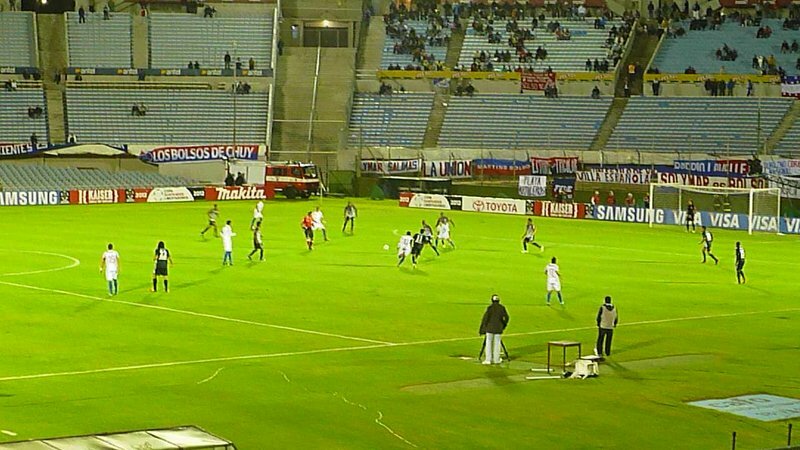 Nacional managed to score in the second half with a nicely deflected ball from the heel of a foreword; home team wins 1-0. The game was a blast. Asa and I are looking forward to other games, as we imagine each game has a different “feel” based on who is playing and the weather. 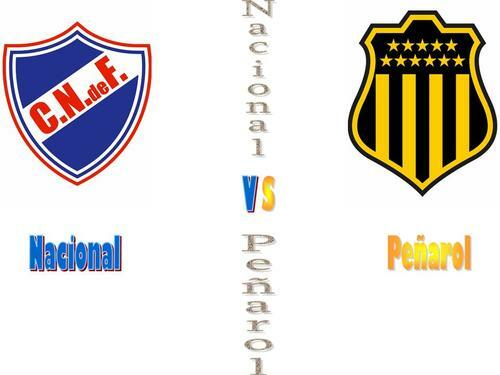 We really want to see a Nacional vs. Peñarol match. Here’s to hoping that there will be one while we are here and that we can get tickets! Check out some short videos I took with my camera: Video 1 and Video 2.